The Indian Super League Regulatory Commission on Thursday handed a hefty fine of Rs 11 crores to FC Goa and banned the owners of the football club -- Dattaraj Salgaocar (three years) and Srinivas Dempo (two years) -- on disciplinary grounds. 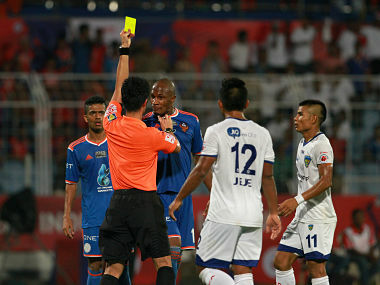 FC Goa were facing allegations of violating ISL regulations namely for 'boycotting match and league ceremony', 'public criticism and threatening match officials,' 'alleging that the match were fixed,' and 'non-adherence of League rules'. FC Goa will also be docked 15 points next season. Stupid decision to fine FC GOA & banning DVS & VSD. Its a black day for football lovers in Goa cos its Dempo & Salgaonkar group who have solely promoted the game. Their contribution needs to b facilitated . Hope good sense prevail upon the authorities to reverse the decision.